I decided to switch up my typical anime palette and introduce a new flavor to the mix: romance. Enter Tsukigakirei, which just so happened to be the romance anime missing from my life. Tsukigakirei tells the story of Kotaro Azumi is in his final year of middle-school and trying to find his place in life. A member of the literature club, Kotaro writes novels in his spare time, but is too shy to share them with his friends and family. He soon finds himself swept up in his first romance when he develops a crush on his fellow classmate and track club member, Akane Mizuno. After working together at the school’s festival, Kotaro and Akane grow closer, and eventually end up dating. Keeping it a secret at first, the pair grow more comfortable in their relationship slowly, and then all at once. No one said romance was easy though, and these middle-schoolers just can’t seem to catch a break. Their relationship gets put to the test when Akane’s best friend Chinatsu develops feelings for Kotaro. Unfortunately for Akane, telling Chinatsu that she is dating Kotaro does little to quell her friend’s interest. Chinatsu ends up telling Kotaro, who thankfully turns her down. Similarly, when Akane’s track club president Takumi reveals his feelings for Akane she too turns him down. Just when it seems like the two will finally be able to enjoy dating each other, Akane’s father announces they’re moving to Chiba. Despite his parent’s wishes, Kotaro insists on going to high school with Akane in Chiba, but unfortunately doesn’t pass the entrance exam. Unable to tell Akane the depth of his feelings, Kotaro publishes a novel online promising to love her forever. Chinatsu shows the story to Akane, who reads it on the train out of the city. Kotaro ends up living up to his promise as he and Akane date through highschool and eventually have a family together. 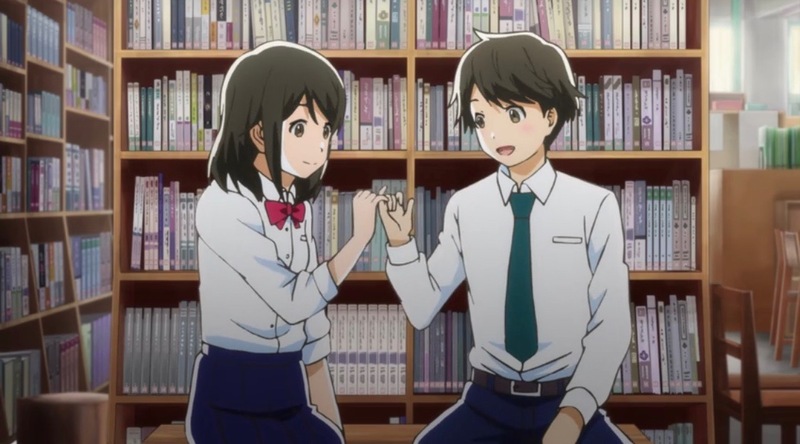 Despite having a typical romance plot Tsukigakirei manages to develop some pretty serious plot points. The double whammy of potential romantic interests coupled with a helicopter parent are pretty intense things for pre-teens to navigate. Still, Tsukigakirei handles this without the plot feeling clunky. Although the romance starts off a little slow, Tsukigakirei also manages to provide a hefty dose of romance in each episode, which really helps offset the other drama. One thing I had to remind myself while watching this was that the characters are in middle school, which was a pretty cringey time for most of us. With that in mind, the characters felt very genuine in their emotions and expressions. Much like most teenagers, Kotaro and Akane view the present as the most important thing in their life and don’t take into account that their actions can have future consequences. This is why it’s good that they have parents and siblings there to tether them to reality. That being said, it was also great to see Kotaro’s parents and Akane’s sister support the two in their decisions and assist them as much as possible. The one glaring issue I had with Tsukigakirei was the way the characters were drawn. Each character has a white highlight around their body at all times. When in profile, a portion of their face is also whited out. I’m not sure if the animation team was trying to make the characters seem illuminated or brighter, but all they succeeded in was making the characters appear washed out or incomplete. The pacing felt pretty good for the plot progression and enhanced the feelings surrounding Kotaro’s and Akane’s relationship. In the beginning the plot moves a little slowly, similar to how the characters first begin dating. It picks up its pace around the time they get into the groove of their relationship and learn about the different people who have crushes on them. By the time Akane learns she is moving, the plot is progressing along at a breakneck speed to their eventual happy ending. One thing that is both a blessing and a curse for Tsukigakirei is the nondescript packaging. The calm scene of Akane and Kotaro standing across from each other belies the romance and the drama that the anime contains. The downside to this is that it ends up coming off as a little bland. In this case you’ll definitely don’t want to judge an anime by its slipcover! All in all, I really enjoyed Tsukigakirei. It’s a really cute romance anime with a lot of relatable feelings about middle-school and first loves. Fans looking to add Tsukigakirei to their collection can purchase it here from Funimation.